At the turn of the twentieth century, automobiles began puttering around Gallatin Valley roadways, their drivers bouncing up and down over rut-filled, unpaved streets. In 1905, Sam Mendenhall (future Bozeman City Manager and son of pioneer John Mendenhall) completed a grueling seven-hour journey by car from Butte to Bozeman, quite an impressive feat for the day. Bozeman residents who could afford such luxuries purchased cars in these early years, but it wasn’t until the end of WWI that the number of automobiles in the area really began to multiply. With the increase in automobiles, dealerships emerged, specializing in sales and repair of these complicated machines. In the 1910s and 20s, dealers and auto mechanics began appearing in the business section of Bozeman’s Polk City Directory. Story Motor Supply, Deem and Johnson, Forschler’s, Lund Motors, L. K. Pence Motors, and Danley & Nason in Manhattan were just a few early Gallatin Valley car dealerships who specialized in brands like Ford, REO, Oldsmobile, Chevrolet, and Studebaker. As time passed, the automobile became ever more important in daily life and dealerships emerged as a huge retail industry. Just a few of Bozeman’s well-known auto dealerships are highlighted here. One of Bozeman’s longest-lasting auto dealerships was established in the late 1920s and operated under one name for decades—Northern Automobile Company—until it was sold to Don Norem in 1967. Northern Auto was originally located at 31 South Willson Avenue, and then moved to 202 West Main Street in the early 1930s. The business stayed in this location (on the southwest corner of Main and Grand) for nearly forty years. Throughout most of Northern Auto’s long history, Dean C. Chaffin acted as president and manager. Mr. Chaffin also held political office and served as Speaker of the Montana House of Representatives from 1953 to 1954. He passed away in 1974. Norine Motors, a Nash car dealership, operated out of a building on North Seventh Avenue in Bozeman from the late 1940s to 1970. Hedley L. Norine started the business, assisted by his son, Robert. Robert Norine later established his own dealership called Auto Discounts. Norine Motors was located at 506 North Seventh Avenue, which put it on the outskirts of town in the mid-twentieth century. Interestingly, the roof of the dealership was painted with directions to the airport near Belgrade. Planes flying overhead were referred to the correct location with an arrow and the words: “Bozeman,” “Gallatin Field 9,” and the coordinates: “45 40” (45 degrees, 40 minutes N), and “111 02” (111 degrees, 2 minutes W). 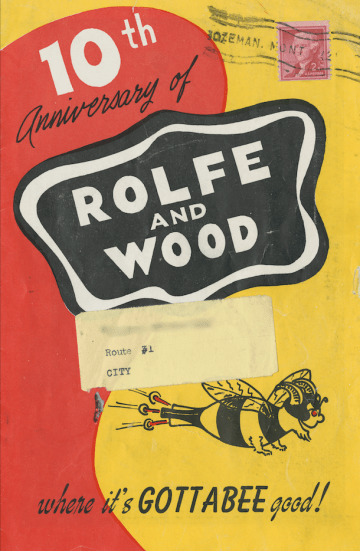 In celebration of their tenth anniversary, Rolfe and Wood published a souvenir pamphlet, complete with photographs of the dealership building on North Willson Avenue, a description of the city of Bozeman, and pictures and short bios of their employees. In one photograph, Hollis Wood and William Rolfe pose with the Rolfe and Wood mascot, a giant bumble-bee creature sporting horns. William Rolfe was active in the Montana Hereford Association, and Rolfe and Wood also owned a cattle business. Rolfe served as president of the Association and worked with others to send Montana Herefords to the 1964 Worlds Fair in New York. After Holly Wood passed away in 1968, the Rolfe family continued to operate the car dealership, and ownership eventually passed to William’s son Tom and his wife Judy Rolfe. The Rolfe and Wood dealership finally closed its doors in the late 1980s. One of Bozeman’s most iconic car dealership buildings was Robert F. Dye’s unique structure, which was built in 1968 on the northwest corner of Main Street and 19th Avenue. The architect, Oswald Berg, Jr., designed a round building that featured an inside showroom surrounded by windows and curved exterior columns stretching above the roofline. Robert F. Dye was the son of Floyd L. Dye, owner of a long-time plumbing and heating company in Bozeman. After WWII, Robert began his professional career working for his father. He started his own Cadillac and Oldsmobile dealership and service business in the mid-1950s. According to Bozeman’s 1956 Polk City Directory, Robert F. Dye, Inc. was first located at 411 North Seventh Avenue, just a block south of Norine Motors. The dealership moved to East Main Street by 1958, where he continued to deal in Cadillacs and Oldsmobiles. After ten years on East Main, Robert Dye and his crew decided to expand west, along with the growing city of Bozeman. Their brand-new, eye-catching building was completed in 1968, and Robert F. Dye, Inc. moved out of its old location at 512 East Main Street (now the current location of Tire-Rama). After another ten years, Robert Dye sold the business and the building at the corner of Main Street and 19thAvenue (1919 West Main Street). A full-page announcement in the Bozeman Daily Chronicle on May 11, 1978, marked the change in ownership. “Help us welcome J. C. Billion, Inc. to Bozeman! We have chosen to sell the assets of Robert F. Dye, Inc. to a young man from South Dakota, Mr. Joseph C. Billion…We wish to thank all our customers and friends for their great support over the years…” Until the property was sold again in 2009, J. C. Billion, Inc. operated a successful car dealership at this location and added on to the existing structure to provide more space for auto service. The dealership’s saucer-like main office area and showroom showed few alterations over the years, providing a unique landmark feature on West Main Street until its demolition in 2011. In 1965, Montana native Don Norem moved to Bozeman and switched careers from ranching and hardware retail to automobiles. 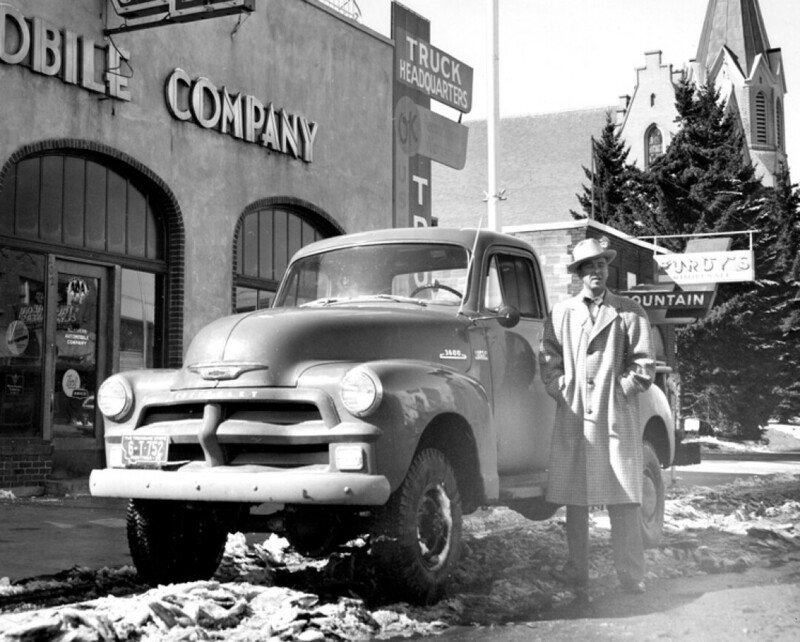 He purchased Northern Auto, a popular Bozeman Chevrolet dealership established in the late 1920s. 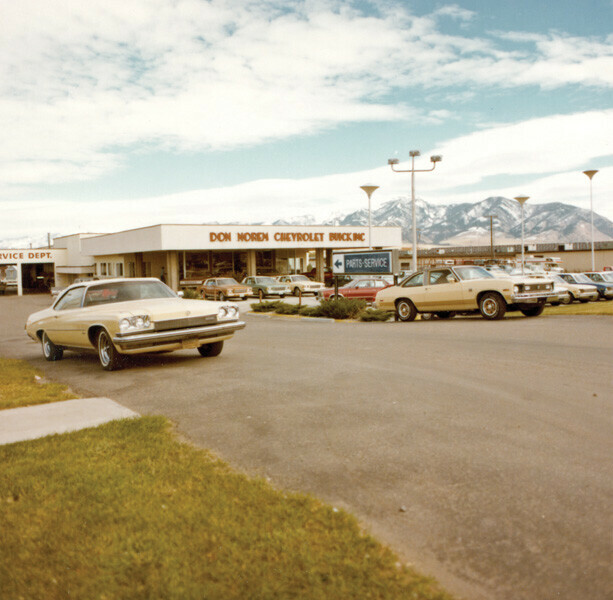 In 1970, Norem did the same as some other local car dealerships and moved west from Bozeman’s downtown core. Don Norem Chevrolet Buick moved across 19th Avenue from the new Robert F. Dye building, to the northeast corner of Main and 19th. A new owner, Pat Connell, took over the business in 1990, renaming it Connell Chevrolet Buick. Today, Don Norem’s original dealership building is gone, replaced by the Safeway grocery store in late 2011. Today, locals have many options when it comes to shopping for a new car. 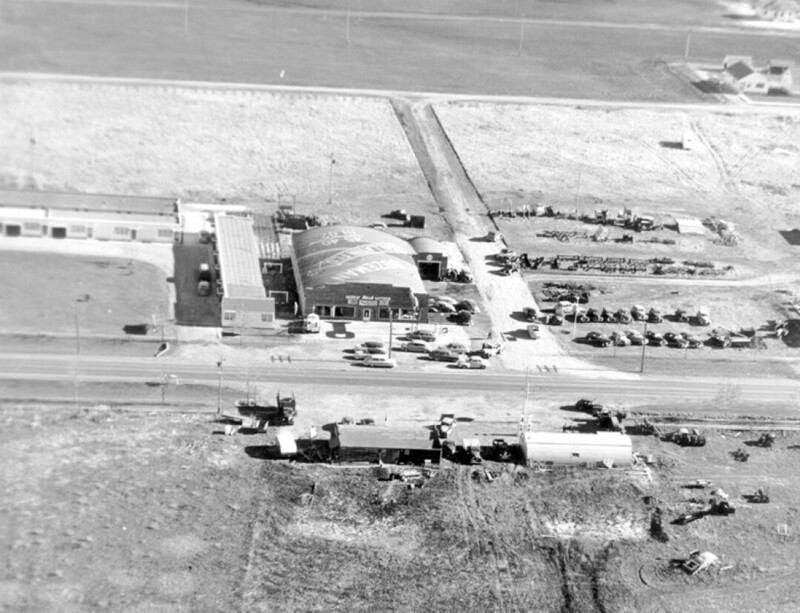 Many large dealerships followed the trend set in the 1960s, establishing large showrooms and car lots on the outskirts of Bozeman. However, there are still plenty of small lots and used car dealerships downtown, offering a large selection to today’s local consumer. One can’t help but wonder what Bozeman City Manager Sam Mendenhall would think of our cars today, one hundred and thirteen years after he made his seven-hour drive from Butte to Bozeman in his brand-new car. We’re still cruising around today—just a little faster.